Yu-Gi-Oh! 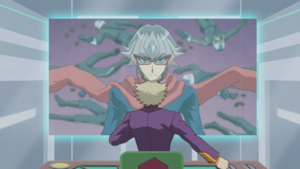 ARC-V episode 54: "City 'Scape"
Jean-Michel Roget is a character in the Yu-Gi-Oh! ARC-V anime and the primary antagonist of the second season. He is a deep cover agent of the Fusion Dimension who crossed over to the Synchro Dimension, infiltrating the dimension by rising to the position of Director of Sector Security, enforcing New Domino City's law. However instead of helping Duel Academy as an infiltrator for the invasion, he betrayed them and intended to control and reconstruct the Synchro Dimension into his kingdom instead, but his plan was defeated by the Lancers persuading the Topsiders and Commons to reform their policies and unite. Full body view of Roget. Roget is a pale-skinned man with a long nose, green eyes, and ash-blonde hair that is neatly combed and arranged on top of his head, but flares out into short wings at the back of his skull. Roget dresses in simple, yet expensive clothes, wearing a closed knee-length purple coat that is held shut by silver clasps over an orange collared shirt. His coat has an orange lining and patterns that cause him to appear as if he is wearing a second shorter coat over his long coat. Roget also wears grey dress pants and black dress shoes. The color of his clothing served as an early hint that he truly was from the Fusion Dimension. Roget is a seemingly cold, serious and calculating individual. He is cunning and methodical, being able to calmly take decisions in order to ensure criminals are apprehended. His calmness was emphasized when he observed the Lancers' use of the other dimensions' Extra Deck Summoning methods and an Action Duel being initiated. Roget seems to have a love for chess as he always has a chessboard with him, and is able to represent a Duel's progress through a chessboard by moving the pieces accordingly to the situation in the Duel as if he was playing it, even going as far as speaking in monologues of how he is "ahead" of "his" opponent. In reality, however, most of his plans and actions so far were foreseen by Declan, thus making Roget actually very behind his opponent. This is more pronounced it the dub; in the Japanese Roget's use of chess terms is very infrequent after his debut, but he continues to use them in the dub. He is an expert strategist, which is proven in the Duel between Officer 227 and Yugo, as Roget was ready to call a "Checkmate" against the Common but quickly realized Yugo's plan and ordered Officer 227 to cancel his attack, an order that was ignored and resulted in his defeat. During this time it was seen that he is cold and strict with his subordinates, as after Officer 227's Duel concluded, he fired 227, going as far as throwing a chess piece that represented him into the trash can. His deviousness was further emphasized by his machinations to overturn New Domino City's structure of power by somehow implanting mind control chips in all of Sector Security's staff to enable the King's Gambit. To get his own desires he is not above manipulation, whether it be verbally or general cheating. Seeing Yuya's potential after his victory over Shinji Weber, Roget praised him as an ally to the Tops. After capturing Yuya trying to get to Sora, Roget tried to convince Yuya that his vision of power was the right thing to do, and that Sora was the enemy. When Yuya refused and tried to stop Roget from capturing Sora, he had Sector Security throw him in a cell, with plans to control him like Sergey. During Celina's Duel with Yugo, Roget altered the track so Yugo couldn't get any Action Cards to win and subsequently endangered his life, knowing the Professor needs Celina for his plans. 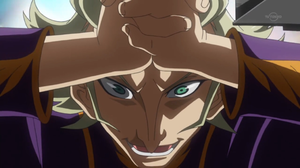 To make sure that the audience were focused on Yuya and Crow's Duel and not his takeover of New Domino City and hopeful that his defeat of the Council and Declan was quiet and quick, he placed a chip for torture by electrocution in Yuya's helmet, invoking his awakened state and putting Crow's life in danger. 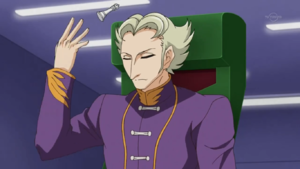 He strongly detests being subordinate to another party, having turned against Leo Akaba after realizing defecting from his cause would benefit his own ambitions, and the High Council due to them blocking his way to absolute power. Roget loses control quickly when things don't go the way he wants, and has been seen repeatedly underestimating the Lancers, especially Declan, being prone to outbursts of frustration. Nonetheless he is skilled enough to make quick decisions. However the more his plans are frustrated the more frequent these outbursts become and the more desperate he becomes. When his plan to have Sergey defeat Jack failed and he lost Sergey as a pawn, he suffered a complete loss of his composure and started showing slight levels of losing his sanity as well. 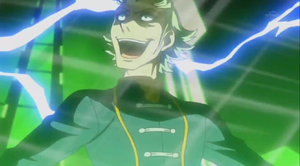 When Yuya and Jack were going to have their Duel to determinate New Domino City's future, Roget burst out in several fits of hysterical and maniacal laughter, declaring himself the only one worthy of determining New Domino City's future, showing that he was becoming borderline insane. Roget also showed himself to be a sore loser and somewhat of a coward, as when his plans to conquer New Domino City were ruined he attempted to flee back to Duel Academy with Zuzu to avoid being seen as a traitor by Leo Akaba, while delusionally calling himself a "winner" even though he was bested. Roget's cowardice and refusal to accept defeat can also be seen in his Dueling style, which relies on holograms which can be replaced each time one of them is defeated and through a stalling strategy, rather than facing the opponent himself. Roget is shown to be extremely cruel and evil. When he invoked Yuya's Awakening, he watched in delight while seeing that Crow and Yuya's life was in danger. He implanted mind control chips in Sector Security officers and Sergey, thus effectively stripping them of most of their free will. When a scientist warned him that the broken chip in Yuya Sakaki's helmet was electrocuting him, Roget's immediate concern was the possibility of the cessation of the electric shocks, caring nothing for Yuya's life or the possibility of brain damage to Yuya. He was also fully willing to have Sector Security kill Jack and Yuya during their second Duel. 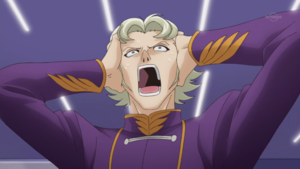 Roget also shows signs of sociopathy, deeming others as nothing more than pawns, no matter how valuable they are to his plans, which is demonstrated by him not caring about Yuya's imminent death due to his mind control chip as long as he serves his purpose of entertaining the crowd, and trapping his subordinates, whom he had no more use for, in a building he set to self-destruct as he ran away. Roget is a Fusion Dimension resident that was sent to the Synchro Dimension as an undercover agent to ensure Duel Academy's conquest. He introduced the ARC System technology to New Domino City, which became a crucial tool for the High Council to strengthen Sector Security's power and maintain the Topsiders' dominance in the riots created after Chojiro Tokumatsu's arrest. Roget then quickly climbed to the position of the Director of Sector Security. He eventually decided to betray Duel Academy, and without informing Leo Akaba he began to make plans to turn New Domino City into his own kingdom. Roget throws away the chess piece. Three years after his arrival, Roget oversaw the chase Officer 227 conducted against Yugo. He watched their Duel and played along with it on his chess board. Roget was ready to call a "Checkmate", but realized 227 was walking into Yugo's trap. Roget ordered 227 to cancel his attack, but it came too late, leading to Yugo's crushing victory, much to Roget's internal anger. After 227's defeat, Roget threw the chess piece that represented 227 into the trash can. The next day, Roget supervised the attempted arrest of Yuya Sakaki, Celina, Riley, and Sylvio, as Sector Security had mistaken them for Yugo and Zuzu Boyle. He witnessed the Lancers activating the "Crossover" Action Field Spell, which caused errors in Sector Security's software. After turning on security cameras, he witnessed Yuya's attempt at entertaining his officers with "Hippo" cards. He then subsequently bore witness to Celina's Fusion Summoning and Yuya's Pendulum Summoning, the latter of which was new to him as well. When the quartet got away with help from Crow Hogan and his "Assault Blackwing - Raikiri the Rain Shower" and the other Turbo Duelists, he stood up calmly and contemplated the oddities he had just seen and concluded that Yuya and Celina were not the same fugitives from the previous night. During Dennis and Gong's Duel, he observed them and witnessed Dennis performing the Pendulum Summon displayed by Yuya earlier as well as an Xyz Summon, studying the mechanics and correcting Melissa Trail's claim that Dennis' Pendulum Summon was the first ever recorded. He concluded Dennis and Gong were part of Yuya's group, placing more black pieces on his chess board. After detecting a Pendulum Summon in the Underground Dueling Arena, he ordered Sector Security to be sent there immediately, deducing that his targets might be hiding out there. After the Lancers and Crow Hogan were arrested, Roget had Celina separated from the other Lancers and sent to "special confinement" because he was interested in her Fusion Summoning tactics. Roget asked one of his subordinates on how Celina was doing, and he reported that Celina initially resisted, but eventually calmed down. The Director of Sector Security decided to pay Celina a visit. He was contacted by one of his staff, telling him that Yugo and Zuzu, who were wanted, had applied for the Friendship Cup and he was shown their application forms. He told her to accept their applications, and muttered to himself that arresting them at the Friendship Cup would serve as an example to the Commons. He later left in a limousine to go see Celina. Later after the Lancers, Crow, Shinji, Damon and Chojiro Tokumatsu broke out of the Facility, Roget and the other Sector Security officers recaptured Tony, who was assisting in the break out. He arrested them and was about to take Celina away, promising to take good care of her. However two representatives of the High Council appeared, telling him that they wanted to see the captured people and that Sector Security must comply. He argued that they were troublemakers and that they disturbed the peace in Commons. Holograms of the rest of the High Council appeared. The representatives told Roget that they would be the ones to judge that. They ordered him to bring the escaped inmates to them, and he had no choice but comply. At the High Council, Roget argued that the Lancers and their allies were disrupting the peace and had the testimonies of the escaped prisoners to prove it. Sylvio responded that they broke out by chance. When Sylvio asked why he and the others were arrested, Roget countered that they were resisting Sector Security. Yuya argued that Sector Security started it in the first place when they arrived in the Synchro Dimension. Roget repeated his argument and stated that the Lancers came from another dimension, which confused the Council and Chojiro. He continued that he arrested the group because he wanted to investigate their foreign Summoning techniques - Pendulum, Fusion, and Xyz. Yuya said that he and the Lancers didn't come here to cause trouble. After this, Declan appeared with Riley and Moon Shadow. He supported Yuya's claims by stating that they came to the Synchro Dimension to protect it against Duel Academy and join forces in the dimensional war. During Sylvio's explanation of the Lancers being Duel soldiers, Roget laughed at the idea of the dimensional war. The Council responded that they learned of the Lancers and the Dimensional War from Declan. Roget asked if they believed that "nonsense". The Council replied that they did not know, since there were people from other dimensions present. Azul used Roget's argument of investigating the Lancers against him. Roget countered that their aim was to invade the Synchro Dimension, which Yuya, Sylvio, and Gong quickly refuted and pointed out that Duel Academy were the true invaders. Roget said that it was up to Sector Security, not the Lancers, to protect this world, but the Council replied that it was their job. The Council proposed they examine each of the Lancers and their allies to prove they were not enemies. Declan suggested that they would do so by participating in the Friendship Cup to prove their skills as Duel soldiers. After the chairman's explanation of the Friendship Cup, Yuya reminded his friends that they needed to find Zuzu, which made Roget realize that she was one of Yuya's allies. When Yuya asked if Zuzu was arrested, Roget denied it, adding that she was an important Duelist who also entered to Friendship Cup and confirming that she was safe. He agreed to Declan's decision and proposed that Yuya Duel Jack Atlas for his exhibition match, since he was the most adept at Pendulum Summoning. He added that Jack would be the one to verify Yuya's strength, which Declan and the Council agreed to. He observed the Duel from his office, with Sergey Volkov standing behind him. When Yugo and Zuzu exposed themselves he had Sector Security attempt to arrest them, but was prevented from doing so by the High Council, causing him to lose his temper at being opposed. When Shinji antagonized the crowd against the Topsiders in his Duel, Roget remained calm, as Sector Security could have handled any riots. Later, he explained to Sergey that he would have him Duel Celina later, in addition to crushing the hopes of the common people in the Friendship Cup by defeating Jack Atlas. He sent a "Goyo Emperor" Fusion Monster to Officer 227, a participant in the tournament, offering to reinstate him if he defeated Yuya Sakaki in his Duel the following day. Despite 227 losing again, Roget was satisfied that the match had served his purposes. He bore witness to Sergey's Duel with Damon Lopez and was unimpressed with the former's victory. He eventually watched Dennis and Shay's brutal Duel, and upon Dennis Summoning "Chaos Ancient Gear Giant", he figured that he belonged to Duel Academy. After Dennis' defeat at the hands of Shay, Roget immediately ordered his men to secure Dennis, but met opposition by the High Council. Having enough of their interference, Roget initialized his "King's Gambit" plan, activating a chip in the head of his Sector Security officers and putting them in a trance to follow his orders and assault the Council's room with several men. He communicated through an hologram and asked the Council if they truly thought they could maintain the peace of New Domino City by sealing his powers. The chairman, White Taki, responded they could not allow him to scheme with Dennis. Roget admitted that while this would be an interesting turn of events, it would ruin his plans if he summoned Duel Academy, for they would brutalize New Domino City. He further explained that he sought to control New Domino City, and corrected himself by stating it was already is under his control as the Director of Sector Security, and not the Council. He further illustrated his point by declaring that as long as they lived on a competitive society, it was only right for those with actual power to govern, while seemingly questioning their right to do so. Taki asked him if utilizing Solid Vision was also part of his plan to strengthen himself. Roget confirmed Taki's words, saying that all that was left was to dethrone Jack and that he already had a piece to make it happen; their interference would move that piece forward. He let the Friendship Cup continue as scheduled and forced the Council to remain silent for now. Declan deduced that Roget was a Duel Academy agent turned rogue and sought to make New Domino City his "kingdom". Roget also confirmed this stating he was done submitting to anybody else, including the Professor, Leo Akaba. Roget stated he recognized Declan as Leo's son and the fact he opposed his father. He offered to ally with Declan, since both shared a common enemy. Declan refused because he found the idea ridiculous and believed that allying with someone who only sought to control New Domino City would provide him with no benefits. Roget lamented the rejection and asked Declan how long he could continue bragging before disappearing. In his room, an infuriated Roget lashed out at his chessboard, stating that with the Council sealed, they would be no problem to him, even if they had Dennis in custody. He also feared the possibility of Dennis returning to Duel Academy to report back to Leo that Zuzu and Celina were in the Synchro Dimension, while also knowing that Leo would send an army, including Yuri, to capture them. This also made Roget afraid that Leo would unmask him as a traitor and he concluded that securing Dennis was vital to protect his agenda. He had the Friendship Cup continue so he could have Sergey Volkov fight Jack Atlas. Knowing that Leo wanted Zuzu and Celina, he planned to capture them and, to that end, pitted Sergey against Zuzu in the second round's first Duel. Initially disappointed by Sergey's low performance, he cursed Sergey when the latter went mad when he considered Zuzu's speech to be premature. When Sergey knocked Zuzu off of the road instead of creating a possibility to bring her in, he had Sergey captured and sent a search party after Zuzu, who could not be found. During Yuya and Shinji's following Duel, Roget scoffed at Shinji's rallying. He believed that the Commons never stood up for themselves because they had all bark and no bite. Like everyone else, Roget ridiculed Yuya's use of "Tuning Magician" and disposed of the chess pawn resembling him, only to be highly impressed when it ended up a key element in Yuya's victory. He left his office, satisfied. Roget congratulates Yuya for his victory. Roget met Yuya as he returned to the Duel Palace. He expressed his great admiration in Yuya's Duel with Shinji, especially when Yuya showed his Pendulum-Synchro Summon. Roget said that Yuya is the only person he could rely on. This has made Shinji suspect that the Duel was fixed from the start. Roget countered by saying that if the Duel was fixed from the start, then Shinji's loss may be a part of it. Before Shinji could argue, Roget put him in his place and sent him in the Underground Labor Facility. Yuya remembered seeing Sora so he attempted to escape with his Duel Runner, but a Sector Security officer blocked him. After hearing Yuya's claim of having found Zuzu, Roget told the officer to let Yuya go. Yuya left and Roget secretly sent an officer to follow Yuya. Sora noticed this, so he grabbed Yuya without being noticed and the two hid. As the two discussed the events that happened, Roget eavesdropped on the conversation via a tracking device set by an officer. Now knowing that Dennis had been sent to Duel Academy, he feared that Yuri might come to the Synchro Dimension soon. Hesitantly, he sent an order to secure both Yuya and Sora. After capturing Yuya, he then conferred with him about his plans to defend New Domino City. During the Duel between Crow and Shay, he noticed Zuzu on the balcony when Shay handed Tarren back to the group. He later called Sector Security to go and capture Zuzu. He was shocked to learn that Sora was responsible for her escape, and he expressed anger towards Sector Security whilst fearing that Duel Academy was making their move. He then told one of his scientists to implant the same mind-control technology into Yuya that he had used on Sergey so he could control Yuya before the latter's Duel with Crow. During Yugo's Duel with Celina, Roget arranged for the Duel lanes to shift so that Yugo would be unable to fully concentrate. He did this for Celina, who he hoped would win, as she would be someone that New Domino City would rally behind during the invasion. He succeeded on this part, as Yugo was unable to land an attack on Celina before she could reach an Action Card, nor was he himself grab an Action Card, since he had to maneuver his Duel Runner to avoid falling both times. Roget's plan was going accordingly as desired until Celina decided not to grab an Action Card, allowing Yugo to turn the Duel around and win. Roget was irritated as he needed Celina to win the Duel so he could have greater control of the masses. Declan speaks to Roget after freeing the High Council. Roget sent Sector Security to recover Celina, however, Riley was able to defeat all three officers. Declan regained control of the Council's building after defeating all of the officers, which infuriated Roget even further. With Zuzu and Celina no longer in his hands and Declan causing interference with his plans, Roget instead chose to eliminate Declan and the Council with Sergey and Sector Security by speeding up the Friendship Cup first semi-finals match on the same night as a distraction. To ensure Yuya won his Duel and gain the attention of the crowd as well, Roget put a chip in Yuya's helmet that would give electrical shocks to a certain part of the brain to force his Awakening to activate. This succeeded to his delight as it awakened Yuya's shared personality with his dimensional counterparts and allowed him to fight aggressively against Crow. Roget was so pleased with the Duel that he even tried to have the course changed to give Yuya an Action Card. However, this was stopped due to the Summoning of "Odd-Eyes Rebellion Dragon" and the destruction of the circuits. He became frustrated when he learned that the Obelisk Force had invaded New Domino City as well. He sent Sergey to parry the invasion and told Sector Security to remain and protect the building under the belief that Zuzu and Celina were inside. Once Sergey took care of the Obelisk Force soldiers at the Capital Building, Roget sent him to capture Zuzu and Celina. Roget became infuriated when Sergey let Celina be captured by Barrett, but he still was able to take Zuzu. The next day Roget calmly watched as the Commons rioted through New Domino City and took advantage of Yugo's absence to change the semi-final match of the Friendship Cup into a match between Sergey and Jack. Before the Duel, he contacted Jack and apologized for making him Duel on such short notice. Jack reassured Roget that he didn't mind and would always accept a challenge. Roget invited Zuzu to his office to watch the final part of his plan, have Sergey defeat Jack in order to destroy all hope for both Topsiders and Commons, then make himself their new symbol of hope thus becoming the ruler of New Domino City. Roget watched in delight as Sergey merged with his Duel Runner, and he described him to Zuzu as the perfect Duel machine. Roget screams in anger as his plan fails. When Sergey Summoned "Earthbound Servant Geo Gremlin" and "Earthbound Servant Geo Gremlina", Jack had to choose to either destroy his "Scarlight Red Dragon Archfiend" to survive another turn or let Sergey gain LP and take his attacks. Roget explained to Zuzu that Jack's only choice was to destroy "Scarlight"; however, that would still cause his defeat through "Geo Gremlina's" effect. He smugly declared "checkmate" on the king; however, to his surprise, Jack chose to keep "Scarlight" alive, and survived Sergey's turn. The intensity of the Duel caused Sergey's mind control to malfunction; Roget desperately ordered Sergey over and over to take an Action Card and win with the effect of his Field, "Earthbound Tundra", only for him to ignore them. Ultimately, Jack won the Duel and Sergey fell to his apparent demise, leaving Roget to watch in disbelief and scream in frustration as his plan completely backfired. Although Sergey survived his fall, Roget soon lost his link to Sergey and instead ordered Sector Security to enforce martial law on New Domino City. When he appeared on holographic screens to announce the change in law to the people of New Domino City, Zuzu pushed him aside, knocking Roget's chessboard over, and she urged the Topsiders and the Commons to stop fighting and recognize Duel Academy as the real enemy. Roget shoved Zuzu away and closed the connection, but the Lancers continued to unravel his plan; Yuya Sakaki was able to return to the Duel Palace and challenge Jack to a Duel. Roget furiously claimed that he wouldn't let Yuya Duel, but he was interrupted by a message from the now-freed White Taki, who cheerfully told Roget that he was not the highest authority in New Domino City anymore. Roget was enraged by Taki's interference. When Yuya declared his intention to Duel Jack, Roget declared himself the true wielder of authority in New Domino City and immediately ordered Sector Security to storm the Duel Palace. However, they were defeated by the Lancers. After Jack accepted Yuya's challenge and declared that their Duel would determine the future of New Domino City, Roget madly declared that he was the one who determines the future and he burst out in mad laughter. He decided to let them Duel, if they managed to live through the experience. To accomplish this he sent a five-man squad of Duel Chasers to intrude in their Turbo Duel, but Jack defeated them with ease. Melissa Trail commented on Jack's refusal to have Roget interfere in the Duel, prompting Roget to scream at her to shut up. His grip on New Domino City was further weakened by the deactivation of the main control system that was controlling Sector Security. Roget performs a Fusion Summon. After Sora and Moon Shadow freed Zuzu, Roget blocked their path and defeated both Sora and Moon Shadow in a Duel. He disabled the other elevators and took Zuzu with him to use as a bargaining chip for betraying Duel Academy. While he was beating Zuzu for speaking out against him, Declan, Riley and Moon Shadow blocked his path. Declan correctly deduced Roget's goal and insulted him, ordering him to beg New Domino City for forgiveness after plunging it into chaos. Roget refused, fled into a room with Zuzu and trapped Declan in there with him. He told Declan to beg for forgiveness himself and come back with him and Zuzu to Duel Academy. Declan refused and he claimed that he would only be going to Duel Academy to destroy it. Roget challenged Declan to destroy him as well and they began a Duel; Roget immediately Fusion Summoning "Ancient Gear Howitzer", and then—after equipping it with "Ancient Gear Magic Shield" to prevent its destruction by battle—dealt 1000 effect damage to Declan on the first turn with what he dubbed "an unbeatable combo". Declan responded by Fusion Summoning "D/D/D Dragonbane King Beowulf" and Synchro Summoning "D/D/D Hexblood King Siegfried", then using the latter's effect to negate "Magic Shield" before attacking with "Beowulf" and "Siegfried" to defeat Roget. Almost immediately, Roget vanished, and subsequently reappeared while the Duel was in progress, which—although penalizing him for half of his LP—allowed him to start the Duel all over again. Undeterred, Declan set up a combo involving the effects of the "D/D Savant Thomas" and "D/D Savant Nikola" in his Pendulum Zones, as well as his "D/D/D Wisdom King Chaos Apocalypse" and "Dark Contract with the Swinging Abyss", defeating Roget again—but again, he reappeared with 2000 LP. Roget continued to insist that he would be continually revived, but Declan explained to Roget that he was now caught in an infinite loop; no matter how many times he reentered the Duel, Declan was guaranteed to win as he could activate his combo every single turn. Roget activates the dimension gateway. His plan foiled, Roget was then revealed to be above them, wearing a holographic interface and keeping Zuzu close by. Roget attempted to trick the Lancers into thinking Declan was working with Leo to conquer the Synchro Dimension, but when that failed he fled the scene into an elevator, Zuzu in tow, and a chase ensued that culminated in Jack's "Scarlight Red Dragon Archfiend" destroying the elevator. While Zuzu was rescued by Yuya, Roget apparently plummeted into the shaft, but climbed out only minutes later, activating a machine that he intended to drop New Domino City into the void between dimensions. However, when the dimensional gateway appeared, Roget was the first to be swept away. Roget's whereabouts and status were left unknown when the series ended, and he was never mentioned again after his defeat. Roget uses an "Ancient Gear" Deck. Like the Obelisk Force, it centers around inflicting effect damage, but utilizes "Ancient Gear Howitzer" rather than "Ancient Gear Hunting Hound" and its Fusion forms. He reinforces his monster with "Ancient Gear Magic Shield", granting it massive DEF, immunity to other card effects and indestructibility by battle, rendering it virtually invincible while slowly eating at his opponent's LP. During his Duel with Declan, it is revealed that Roget never Duels his opponents personally, instead opting to use holographic clones of himself. If one of the clones is defeated, another will take its place - although this costs Roget half of his LP due to the intrusion penalty, he can repeat the process infinitely, allowing him to keep using the effect of "Ancient Gear Howitzer" until his opponent is defeated. ↑ 1.0 1.1 1.2 Yu-Gi-Oh! ARC-V episode 54: "City 'Scape"
↑ 2.0 2.1 2.2 2.3 2.4 2.5 Yu-Gi-Oh! ARC-V episode 76: "Plans of Attack"
↑ "TV Tokyo Yu-Gi-Oh! ARC-V Characters". July 26, 2015. ↑ 4.0 4.1 Yu-Gi-Oh! ARC-V episode 98: "Friendship Finale"
↑ 5.0 5.1 Yu-Gi-Oh! ARC-V episode 80: "Where the Truth Lies"
↑ 6.0 6.1 Yu-Gi-Oh! ARC-V episode 82: "Warriors of the Air"
↑ 7.0 7.1 Yu-Gi-Oh! ARC-V episode 83: "A Matter of Trust"
↑ 8.0 8.1 Yu-Gi-Oh! ARC-V episode 84: "A Plan and a Promise: Part 1"
↑ Yu-Gi-Oh! ARC-V episode 55: "Tops Speed"
↑ Yu-Gi-Oh! ARC-V episode 56: "Synchro Sector"
↑ Yu-Gi-Oh! ARC-V episode 57: "Super Duelists"
↑ Yu-Gi-Oh! ARC-V episode 58: "Scream for the Green"
↑ Yu-Gi-Oh! ARC-V episode 60: "Showdown in the Slammer"
↑ Yu-Gi-Oh! ARC-V episode 61: "Hero's Fall"
↑ Yu-Gi-Oh! ARC-V episode 62: "The Great Escape"
↑ 16.0 16.1 16.2 16.3 Yu-Gi-Oh! ARC-V episode 63: "Fight for Freedom"
↑ Yu-Gi-Oh! 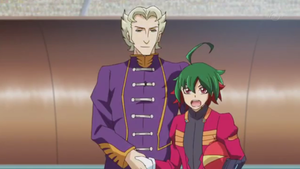 ARC-V episode 64: "Match with the Master"
↑ Yu-Gi-Oh! ARC-V episode 65: "Traits of a Traitor"
↑ Yu-Gi-Oh! ARC-V episode 68: "Common Cause"
↑ Yu-Gi-Oh! ARC-V episode 70: "The Gift of Grit"
↑ Yu-Gi-Oh! ARC-V episode 71: "Duel Consequences"
↑ Yu-Gi-Oh! ARC-V episode 73: "Turning Point"
↑ Yu-Gi-Oh! ARC-V episode 74: "A Traitor Unmasked"
↑ Yu-Gi-Oh! ARC-V episode 75: "Shay's Revenge"
↑ Yu-Gi-Oh! ARC-V episode 77: "A Cons Game"
↑ Yu-Gi-Oh! ARC-V episode 78: "Rebel Road"
↑ Yu-Gi-Oh! ARC-V episode 79: "Road To Rebellion"
↑ Yu-Gi-Oh! ARC-V episode 81: "Battle Birds"
↑ Yu-Gi-Oh! ARC-V episode 85: "A Plan and a Promise: Part 2"
↑ Yu-Gi-Oh! ARC-V episode 86: "Against All Odds"
↑ Yu-Gi-Oh! ARC-V episode 87: "The Many Dimensions of Yuya"
↑ Yu-Gi-Oh! ARC-V episode 88: "Wake Up Call"
↑ Yu-Gi-Oh! ARC-V episode 92: "Tragic Reunion"
↑ Yu-Gi-Oh! ARC-V episode 93: "Road Rage: Part 1"
↑ Yu-Gi-Oh! ARC-V episode 94: "Road Rage: Part 2"
↑ Yu-Gi-Oh! ARC-V episode 95: "Martial Law"
↑ Yu-Gi-Oh! ARC-V episode 96: "The Imitation"
↑ Yu-Gi-Oh! ARC-V episode 97: "Making it Mine"
↑ 39.0 39.1 Yu-Gi-Oh! ARC-V episode 99: "A Vicious Cycle"
This page was last edited on 19 December 2017, at 22:57.